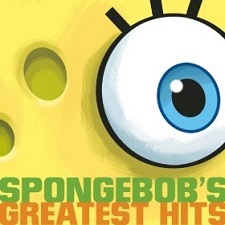 Since its launch in July 1999, SpongeBob SquarePants has emerged as a pop culture phenomenon. The series chronicles the nautical and sometimes non-sensical adventures of SpongeBob, an incurably optimistic and earnest sea sponge who lives in a two-story pineapple in the sub-surface city of Bikini Bottom, and has been the number-one animated program with kids 2-11 for more than 12 consecutive years on Nickelodeon. Over the past several years, it has averaged more than 100 million total viewers across all Nickelodeon networks. 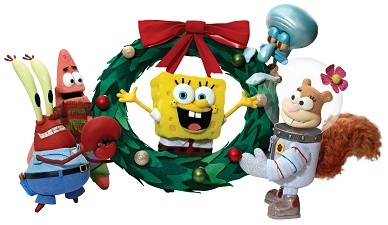 For this Christmas, Nickelodeon produced the first stop-animation feature for SpongeBob SquarePants, It’s a SpongeBob Christmas!, premiering on Nickelodeon Thursday, Dec. 6, at 8:00 p.m. (ET/PT), following its CBS television premiere (11/23). The brand-new half-hour short is inspired by the popular song, “Don’t be a Jerk, It’s Christmas,” by Tom Kenny (voice of SpongeBob SquarePants) and Andy Paley. In this new special, Mr. Krabs’ nemesis, Plankton, vows to get his Christmas wish – obtaining the Krusty Krab’s secret Krabby Patty formula – by turning everyone bad in Bikini Bottom with the help of his special jerktonium-laced fruitcake. 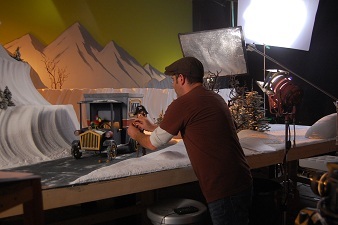 Stop-motion animation was directed by Mark Caballero and Seamus Walsh and produced by Chris Finnegan of animation collective Screen Novelties, whose whimsical approach to filmmaking combines classic cartoon dynamics with puppetry and stop-motion. 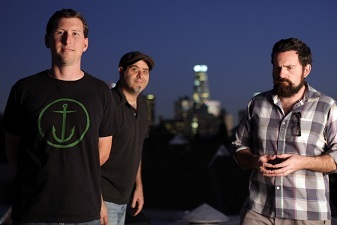 The trio was instrumental in launching Robot Chicken and Moral Orel for Adult Swim. They’ve directed a number of public service announcements and commercials for clients such as Nike, Hallmark, and McDonald’s. Screen Novelties’ award-winning short films include Mysterious Mose, The Tortoise & the Hare, and Monster Safari, which is currently being developed as a feature film. 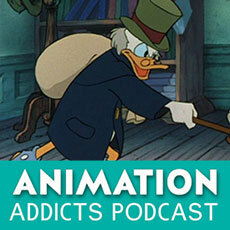 Animated Views: You describe yourselves as an “animation collective”, not a studio. What is your M.O.? Screen Novelties: We are a collective of like-minded artists comprised of the three of us – founders Mark Caballero, Seamus Walsh and Chris Finnegan – and joined by many other collaborators from sculptors to animators. Over the years we’ve aligned ourselves with people who have similar sensibilities, which makes it easier to achieve the desired end result on any given project. We dig it when people come to Screen Novelties because they see something in our house style that they can’t get anywhere else. SN: We try to infuse everything we do with a bit of anarchy… let things be loose and not feel too labored over, and hopefully exude fun. Our character designs tend to have a light-hearted, simplified look. Lots of influences: from Jim Henson’s early style, UPA, George Pal. We strive to incorporate 2D conventions in our animation like squash-and-stretch, blur effects, googly eyes, etc. One of our main points when we’re pitching an idea is – “Look – It’s stop-motion, but it isn’t goth!” All that said, there’s also an undercurrent of weirdness in our stuff as well, which keeps it from getting too soft. AV: How was it decided to make a SpongeBob film in stop-motion? SN: We’ve been fans of each other’s work for some time now. 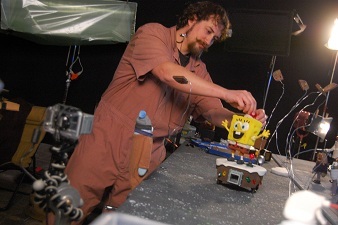 Mark Osborne directed the live action for the SpongeBob SquarePants Movie and suggested we tackle the clay sequence for the same film. Mark and Paul Tibbitt had been key players in one of our favorite short films: Herd. Later, Paul asked us to do the Title Sequence for Truth or Square after he and Steve Hillenburg had seen what we did with our short film, Graveyard Jamboree. They wanted us to use those same creative sensibilities to reinvent the Title Sequence for that episode. 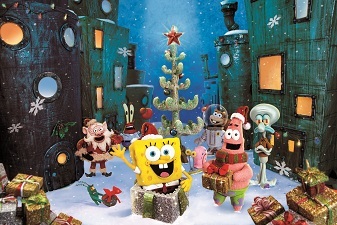 Very soon after that, Nickelodeon wanted to do another SpongeBob Holiday special. Paul thought it should look and feel different than the first special so he called us. AV: How was it to be asked to produce a special on such iconic character? SN: We’re still completely humbled that the Nick folks dug our work enough to let us handle the most popular cartoon character in the world. It was honestly really daunting, especially since we didn’t want to take it in the most obvious route, and for Steve & Paul to trust our creative process that much was totally amazing. AV: How did you create the stop-motion version of those 2D characters? SN: We factored in an R&D phase for puppet design and fabrication in order to work out some of the details before we went into production. A lot of time was spent searching out the perfect materials for each character. Of course, the majority of that time was spent on SpongeBob. We had to make sure the end result exuded SpongeBob’s spritely personality. 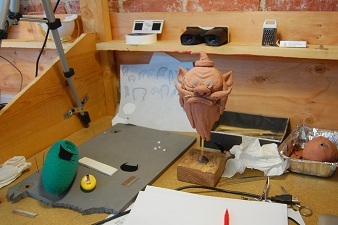 For other characters, we modeled mouths in CG then had them printed using the rapid-prototype system. Then, we “devolved” the slick factor out with fabric, furs or other textures until we were creatively satisfied. Translating the 2D SpongeBob characters into puppets was a major challenge, but we’re pretty happy about how they turned out. 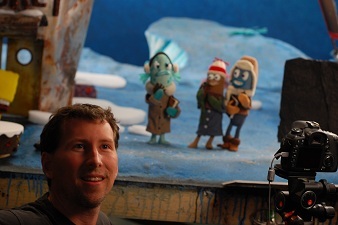 AV: Stop motion has its own codes of expression, different from animated drawings. How did you approach the animation regarding the 2D version? SN: One of the best things about SpongeBob is all the crazy takes and expressions he does. We wanted to preserve that as much as possible. But with stop-motion it’s a little trickier because you have to build unique puppets for each expression, as opposed to drawing them. So we had to pick our spots and be inventive, and we love how it turned out. We also found that we could make some quick in-between models for squash-and-stretch. They didn’t have to be that detailed because they were only on camera for a few frames. Persistence of vision is a great thing! AV: What kind of stop motion techniques did you use? SN: It depends on the project and what feeling we want to convey. Sticking to one stop motion technique can get a little repetitive and boring at times so we always end up mixing it all together. We emptied our magic bag of tricks for SpongeBob and used a little bit of everything. Replacement, RP, build up, puppetry, Smear… we could go on but I think you get the picture. 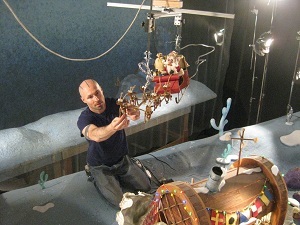 AV: How did you adapt the cartoony environments of the series to stop motion sets? SN: We opted to not copy them exactly and tried to use found objects in off-kilter ways as much as possible. For example, Bikini Bottom is made up of cast away items that sunk to the ocean floor. Wegrabbed a bunch of weird crates and detritus that we felt would make cool, underwater buildings and “puppetized” them for our stop motion. Meaning, they were modified to have a puppet-like feel to them. AV: How did you treat the songs that inspired the story? SN: We strive for a sense of rhythm and musicality in our animation whenever possible. So the songs like “Santa’s Eyes” and “Don’t be a Jerk” were a source of inspiration, not a limitation. We could approach those scenes like mini music videos and free ourselves up to do some over the top, more theatrical shots. 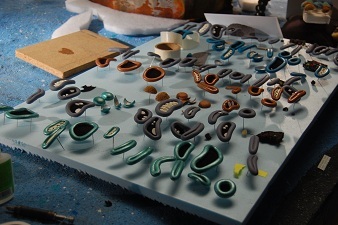 Everything was broken down pretty meticulously to the beat, which is our favorite way to animate. AV: How was it working with the voices of the series, especially Tom Kenny, and with Santa’s John Goodman? SN: Tom and the rest of the cast are great. They’ve been doing these voices for a while, so the characters have such strong personalities. Tom is also a genuine fan of animation and knows his stuff. It’s cool working with an actor who appreciates what we do, the craft of it. And John Goodman, what can you say? He’s a living legend and rightly so. AV: What does that project represent to you? SN: This Christmas special is a chance for us to show our style to a wider audience. 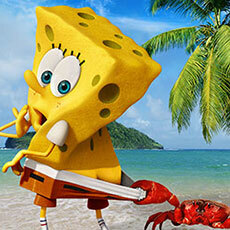 SpongeBob has so many devoted fans and it’s exciting to see how they react to Screen Novelties’ version of SpongeBob. Over the years, we used a lot of techniques and experiments on smaller projects. So it was really satisfying to incorporate all that, plus some new ideas into long form film. With all this attention, we’re excited to move forward and show everyone what we can do with our own stories. Our thanks to Mark Caballero, Seamus Walsh and Chris Finnegan at Screen Novelties, and Fumi Kitahara!